The lies we tell ourselves about luck and happiness. For many years BP and I led a kind of blessed life. A few years after meeting my Mum offered a tumble down house she owned, rent free, until its demolition paperwork came though. It seemed a shame for the house to be empty while they waited, especially as BP and I were separately paying rent in different houses. BP and I never intended to move in together having had less than fun experiences with former partners, but the opportunity was too good to waste. This three month experiment in living together extended into two years while the permits were way laid. Eventually the house (which was in very bad condition) was heritage listed and had to be sold rather than demolished. On the up side, BP and I found we quite enjoyed living together, despite our initial reservations. Over those two years we saved a deposit for a house, travelled to New York twice, got engaged and were married. Things were really great – BP’s music was doing really well, I scored my dream job. Shortly after buying our own home I got a permanent position at my job and then we discovered we were pregnant with Little Fearse. We had a beautiful second honeymoon in Thailand. I had a wonderful pregnancy, an easy birth and we found ourselves with a perfect bundle of joy. There were times where things didn’t go according to plan. Two months after Little Fearse was born BP lost his job, but he found new work relatively easily and started on his current path of study. Going back to work with Little Fearse was 9 months old was hard for all of us and finding the balance between parenting and teaching was an initial struggle. These minor setbacks didn’t impact on our overall happiness. When Little Fearse was about 14 months old we became pregnant quickly and easily with our second baby. Things were really coming up Fearse. Sometimes we felt untouchable. Mostly, though, I worried about when our luck would turn. When were the scales going to balance? What was going to strike us down? I couldn’t feel happy without also feeling a sense of doom. On a bad day it was like I was sabotaging my own happiness. Since our miscarriage in September and our subsequent failure to conceive I have often found myself heading down a pathway of thoughts that is not at all healthy. Things are bad now because they have been so good before. We didn’t appreciate our happiness enough. It’s our turn to feel hurt and failure. Our luck has run out. Why should we have happiness when other’s don’t? I have to keep reminding myself that life doesn’t work like that. Life isn’t fair. Some people go through their entire lives never experiencing any real disasters, other than the “ordinary” grievances we all have to endure eventually. Others experience much more pain, or ill health, or tragedy than they could possibly deserve. If life were truly like this the same kids wouldn’t show up to school every day tired from looking after their siblings all night because their parents can’t, or without food, or with bruises on their bodies. It’d be shared between all the children, like a roster – and those kids would have ‘lucky’ days where they had great food for lunch and a new iPad waiting for them when they got home. I spend so much time touting the line to my students “life isn’t fair”, why have I allowed myself to believe that we are really ruled by some cosmic scales of justice? For most of us life is made of ups and downs. There are black spots, there are bright spots. There are times where life cruises with a few speed bumps. The reality is, this blip in our lives is just that, a ‘blip’. One day in the future I will have accepted that I am going to be the mother of just one, beautiful, perfect child. Or, I will find myself Mum to a chattering, chaotic hoard of kids. I will feel happy again. I hope at that time that I can truly feel my blessings and not be afraid of what comes next. I hope that I will be able to live in the moment of joy and no longer feel afraid of when my luck is going to turn. I will be happy without being afraid. Sometimes I think we’re wired to look for the negatives in life. Instead of living for the moment and remembering every laugh and smile, we focus on the bumps in the road, the dust in our eyes. Today the Fearse family headed for the zoo. It was insanely busy – something we’d failed to consider when planning a trip for a public holiday. The queues at the entrance were looooong, even for the members line. The crowds between us and the animals often blocked our view. The safari buses were full. We took lunch for Little Fearse but decided to buy our own as a treat. The lines for lunch were so long we gave up. We all got a little bit sunburnt. having time to chat on the hour long drive. listening to our favourite music in the car. the smile on Little Fearse’s face when she first saw a lion. the way she giggled when she saw the giraffes in the wild. our morning tea on the lawn, in the beautiful sunshine. the gourmet bbq we had with gorgeous friends afterwards. Little Fearse and her buddy splashing and giggling in the bath. that nothing compares to a beautiful day with your family. Every day we have that decision to make. Sometimes things are painful or intolerable or irritating. Not every day looks like today. Sometimes it’s much harder to find our happiness. During our recent hard times we found it in the support we could offer each other. 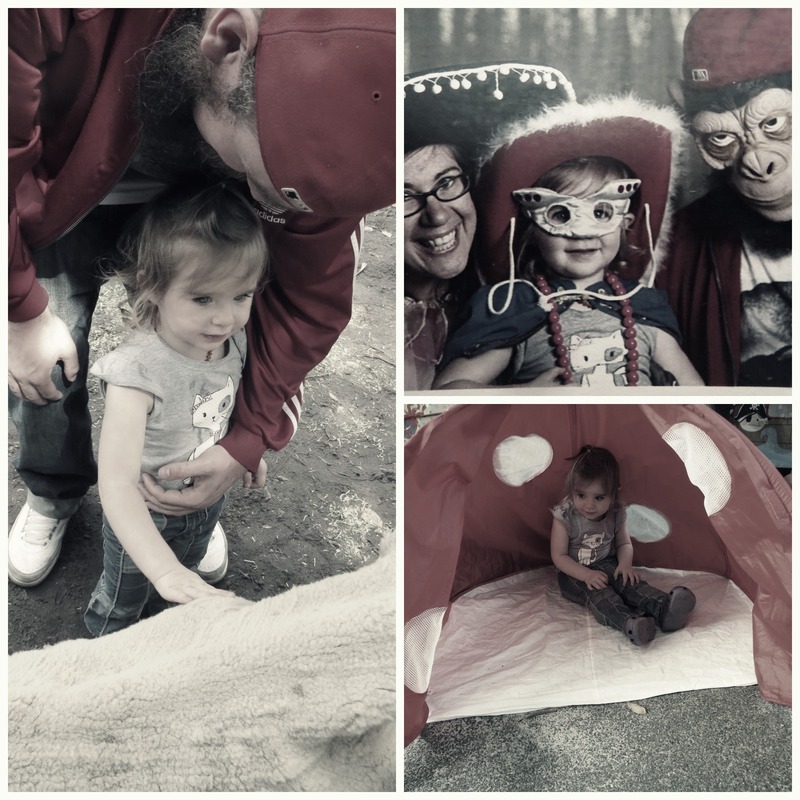 When we were really in the depths of our sadness we went to the zoo, too. We gave ourselves a new shared experience to throw light over our unhappiness. We had to make a decision this year to focus on happiness and it hasn’t been as hard as we imagined. Even in times when we don’t feel happy we have the memory of happier times to remind us that it is possible and always preferable. We have re-wired ourselves for happiness. What about you?